The Cream Server provides maximum service in a compact space, without electricity. It's designed to hold bulk cream at a safe temperature in your coffee station for hours while the gleaming stainless steel design signals quality and cleanliness to your customers. The Cream Server is constructed of a stainless steel exterior, one-piece seamless plastic interior and foamed-in-place polyurethane insulation. 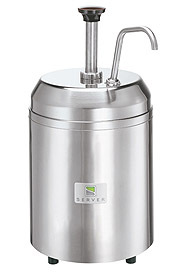 Dispense directly from the included (3-quart/2.8 L) stainless steel jar. To keep your cream or other dairy products cold, use the two included Eutectic Ice Packs (one for use and one for your freezer). The stainless steel pump works with fingertip ease. Plus, investment cast valve bodies and welded joints offer more corrosion resistance and durability. Maximum stroke yields a 1-oz (30 mL) serving with gauging collars provided to reduce the yield in 1/4-oz (7 mL) increments.